12" adds, "I'm Gonna Be A Wheel Someday" and "Ain't That A Shame"
Detail : Paul's forty-first single. Released as a forerunner to "Flowers In The Dirt" which arrived one month later, "My Brave Face" and the B-side "Flying to My Home" are written by Paul and Elvis Costello and were actually recorded back in September 1987. This time the 12", CD, and cassette single all feature the same extra tracks ... "I'm Gonna Be A Wheel Someday" and "Ain't That A Shame" destined for the CHOBA B album. A promo video is shot on 10th and 11th April 1989 at Strawberry Fields in Liverpool, whereby Paul and his backing musicians are filmed in Black and White in a performance shoot. When the video is released, it includes some old home movie clips which Paul purchased at the 1986 Sotheby's auction. There is plenty of great Beatles memorabilia shown, and at one time one can see Elvis in the studio with Paul. 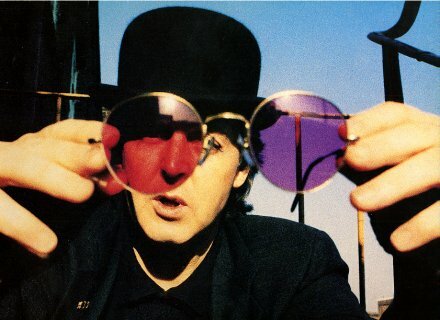 At the same time Paul prepared a colour version of the shoot, which is subsequently released as "The Making of My Brave Face". The single was released in a picture sleeve with the photograph taken by Richard Haughton. The 12" has a stiff VERY pink inner sleeve, and the label is the "new" parlophone label.